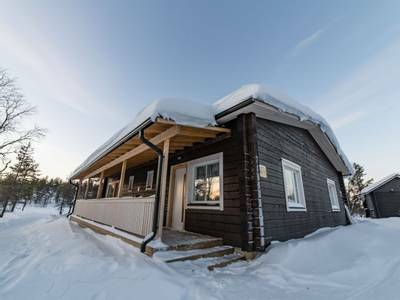 This is a unique destination recently bought by the same wonderful family who own Nellim, one of our most successful Northern Lights destinations. This has a different feel to Nellim being located amongst the fells to the south of Ivalo. 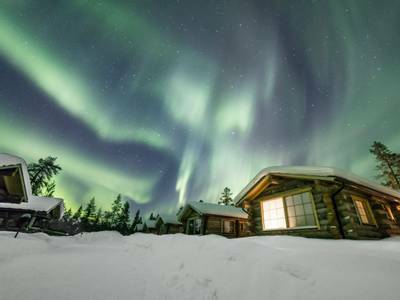 The forest destination and absence of artificial light pollution mean this wonderful wilderness destination gives you a very high chance of seeing the Northern Lights in this area. The hotel has the same welcoming staff and expert guides many will have experienced at its sister hotel and I predict it will be extremely popular with our guests. Muotka is one of our most scenic locations, tucked away in the fells and forests of Northern Finland. 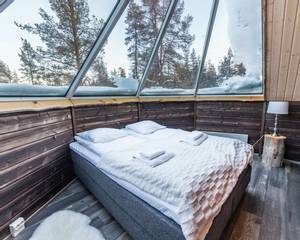 This 7-night stay offers a balanced itinerary to showcase some of the best landscapes and experiences in Lapland during the day, and exceptional Northern Lights excursions as night falls. 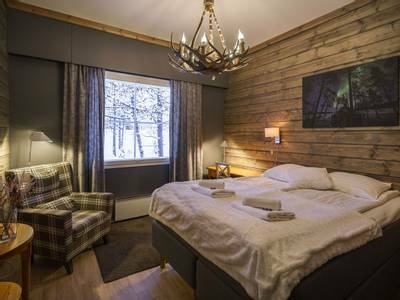 Muotkan Maja Wilderness Hotel has become a stand-out favourite amongst our guests. 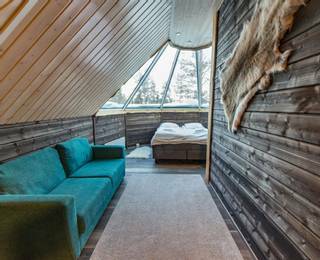 This recently renovated accommodation charms guests with its hospitality, Nordic décor and fantastic guides. 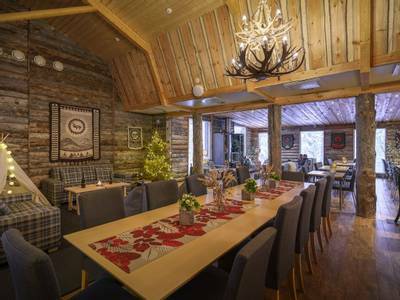 Muotka's location is delightful, surrounded by trees and next to a small stream. 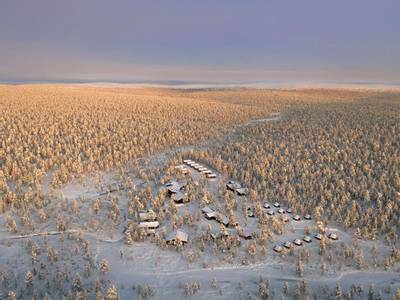 Muotka is tucked away in its own little winter world, a retreat from the modern world. 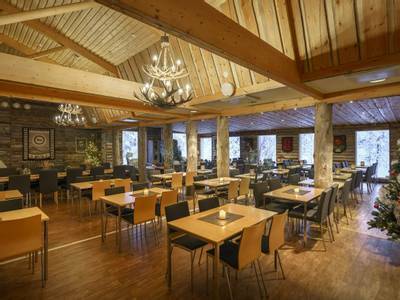 Residing amongst the forested fells of North East Finland and far from the nearest town, the hotel offers a wonderfully secluded base for your adventure in prime Aurora territory. The minimal light pollution here, means, that if conditions are right, there is great potential for viewing the Aurora just outside the hotel. During the winter, this region receives some of the highest levels of snowfall in Lapland and we really exploit this during this holiday. Guests will enjoy snowshoeing and cross-country skiing, allowing you to get close to this stunning landscape and hopefully some of the wildlife that lives here. 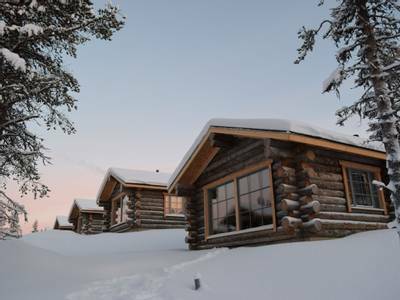 There are also snowmobile and dog sled safaris included; two exceptional experiences which give you a sense of the scale of the wilderness in the region. 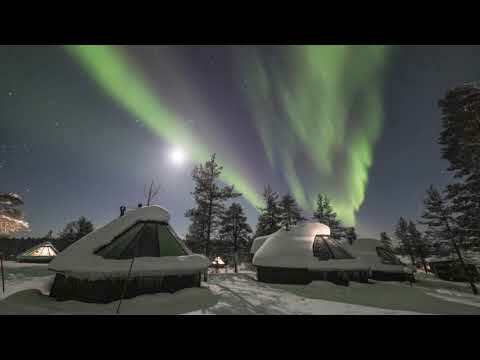 Of course, you are here to search for the Northern Lights and this is done in serious style at Muotka. The evening hunts are varied and you will take part in Aurora searches using snowshoes, a snowmobile-pulled sleigh and a minibus. Each activity is designed to maximise your Aurora viewing potential and all activities are led by expert guides with a wealth of invaluable local knowledge, essential when Aurora hunting. If you would like to really go all out on the Aurora front then we can also arrange for you to spend all or part of your stay in the magnificent Aurora Kotas here. 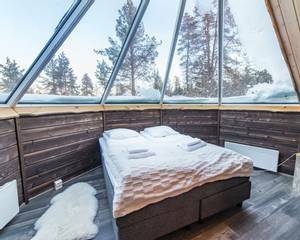 These cabin/glass tepee combinations offer guests many added comforts and nights filled with Northern Lights opportunities. 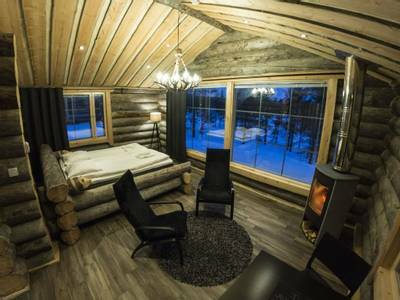 We have loved Muotka from the beginning and it offers a sense of escapism that can only be found when you know you are somewhere very special and enjoying incredible experiences on a daily basis. 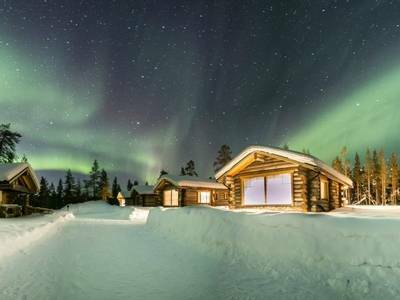 The fact that it offers guests the most wonderful chance of seeing the Northern Lights is the icing on the cake! 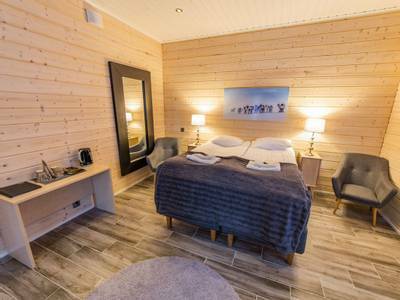 You will be met on arrival at the airport and transferred* to your accommodation at Muotkan Maja Wilderness Hotel, your new home for the next seven nights. 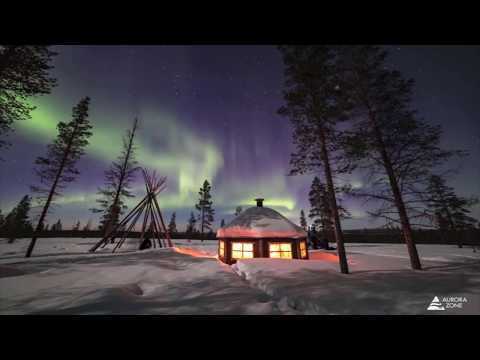 You will have a meal this evening and we would suggest casting your eyes up to the night sky – the Northern Lights often welcome guests to Lapland in spectacular fashion. 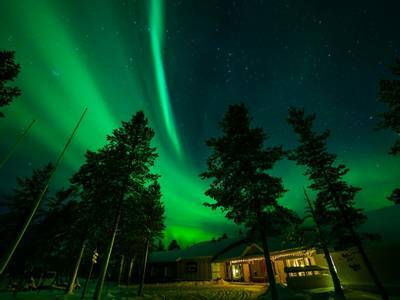 Your adventure at Muotka will begin with an Aurora workshop led by one of the knowledgeable guides. The guide will provide information on the science behind this natural phenomenon and advise you on what you should be looking out for during your Aurora hunts. They will also advise on the optimal camera settings that should help you capture any display on film. 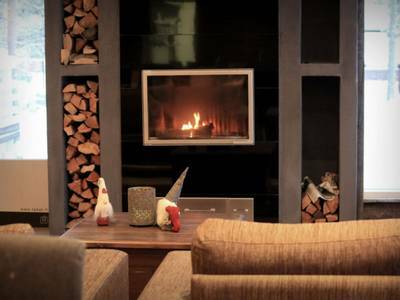 After lunch, you will enjoy your first foray into the beautiful wilderness which surrounds the hotel when you head out on a cross-country ski adventure. Cross-country skiing is something of a national pastime in Finland and is enjoyed by people of all ages. There are a variety of trails which surround the hotel and your guide will lead you on one of these, allowing you to gain an appreciation of how scenic and peaceful the landscape is here. Full tuition is provided so you do not require any experience. You will be out for around two hours. As this activity can be rather addictive, there is the opportunity to hire skis from the hotel later in the week and explore independently. Dinner will be served at Muotka tonight before your first search for the Northern Lights gets underway. 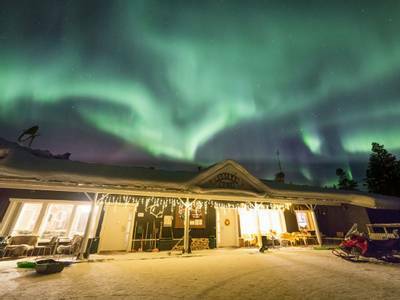 Your inaugural Aurora hunt involves heading out to an Aurora Camp on a sled pulled by the guide's snowmobile. Your guide will drive you to one of the best locations in the area from which to witness an Aurora. The guides here have expert knowledge and a huge amount of experience which they utilise when choosing the best routes for the evening searches. If conditions are favourable you will hopefully, catch a glimpse of the Aurora Borealis. This activity will last for approximately two and a half hours. Snowmobiles have become essential machines in this corner of the world, keeping remote communities connected and also providing reindeer herders with an easier means of tracking down their dispersed herd. However, for visitors to this area, they are also a thrilling way to make as much of the winter landscape as possible. After full instruction and a safety briefing, you will head out into the vast wilderness travelling two people per machine. Your destination for the morning is a reindeer farm around 20km away so there will be the chance to swap drivers (providing you both have full driving licences and are over 18) allowing you both to take control of the snowmobile and travel as a passenger, enjoying the scenery. Upon arrival at the reindeer farm, you will be able to chat with the herder and ask them any questions you may have. Reindeer herding has been an inherent part of life in Lapland for many hundreds of years and today you will learn a little about the fascinating history of herding and its importance to the local culture. This activity lasts for around four to five hours and included a soup lunch. This evening you will be provided with snowshoes and your guides will lead you to a great Northern Lights vantage point. The snow-covered trees can look like unique sculptures in the beam of your headlight and the absolute silence when you stop is something you rarely get to experience. Your guide will serve warm drinks as you wait patiently for a potential Aurora. In total, this activity is approximately two and a half hours long. Today you will have a free day to enjoy as you please. Breakfast and lunch will be served at the hotel. After dinner, there will be another dedicated search for the Aurora as you head out in a heated minibus to try and track down a display (approximately two and a half to three hours). The mobility provided by the minibus allows your guide to utilise the weather and Aurora forecasts to determine the best route to take to avoid any potential cloud cover. Hopefully, your efforts will be rewarded with a wonderful display. This morning you will have the chance to explore on foot. The use of snowshoes dates back centuries and their performance when navigating areas of deep snow should not be underestimated. With these shoes strapped to your feet, your guide will lead you through the forest, pointing out areas of interest and hopefully highlighting some of the wildlife between the trees. You will be out for around four hours in total. Lunch will be enjoyed back at Muotka or around the campfire, depending on the weather conditions. This afternoon is left free for you to set your own agenda. 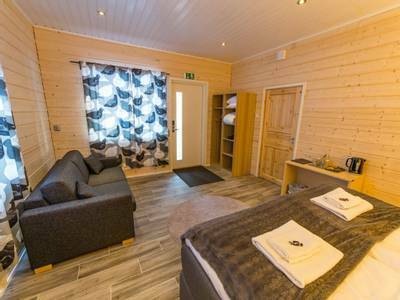 You may want to book an additional activity (payable locally) or alternatively, you can take advantage of one of the saunas or enjoy a good book and some downtime. There are no Aurora activities planned with your guide tonight, however, the skies above Muotka have produced inspiring displays of the Northern Lights and you don't necessarily have to go very far to witness a wonderful show. With any luck, the sky will be filled with a dazzling array of colours. Guests may like to spend this evening (or any other night) in an Aurora Kota at Muotka – the ultimate Aurora hunting rooms with the chance to view a display from the comfort of your bed. Full details can be found in the 'Personalise' section of the holiday page. This holiday has been designed to balance activities with free time in which you can simply relax and enjoy your surroundings. Snowshoes and cross-country skis can be hired from the hotel if you wish to explore independently and there is also a selection of additional activities which can be arranged for you. 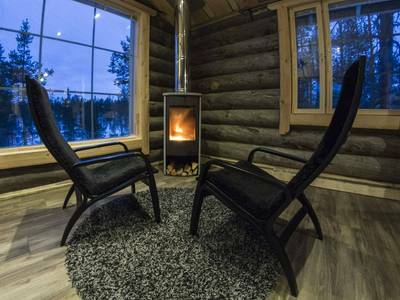 Muotka is just one of those places where spending the day with a good book, admiring the views and enjoying a sauna can also be a rather lovely thing to do. On your final day at Muotka, you will try an activity which is a definite bucket list experience; driving a husky team across the Arctic wilds. Following breakfast, you will meet your team of eager dogs who will no doubt show their enthusiasm and willingness to get out on the trail. After receiving instructions you will set off, two people per sled, (one person will stand on the back of the sled controlling the brake and another will sit in the sled) for around two hours. There will also be the opportunity to chat with the mushers who make their living here and ask them any questions you may have about their dogs and their lives north of the Arctic Circle. You will be driving the sled for approximately two hours. After your last dinner at the hotel this evening you will head out for your final Aurora hunt. 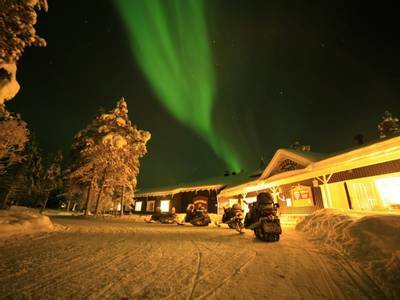 You will once again travel via snowmobile-pulled sleigh to an Aurora Camp. Fingers crossed, the Aurora will bid you farewell. Today is departure day and you will be transferred back to the airport to catch your return flights. If you are on an early flight, you will be provided with a breakfast box. If you can't quite bear to leave just yet, then we can arrange for you to enjoy a city break in Helsinki on the way home. See the 'Personalise' section for details. 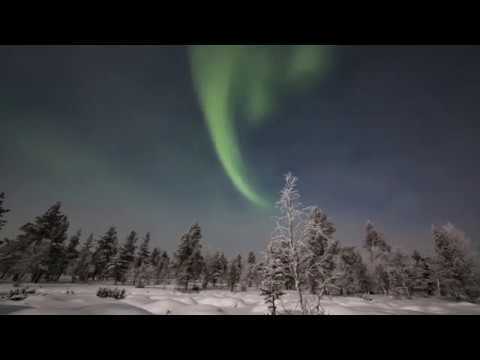 Feel lucky that we got to see the Northern Lights and Muotka Wilderness Hotel was lovely. An absolutely amazing holiday, definitely one for the Bucket List! Obviously seeing the Aurora was the best activity as it was the reason for our holiday, however, our best daytime activity would have to be the dog sledding - a big tick off anyone's bucket list. Such a great holiday, relaxed but organised. The staff at Muotka were excellent. 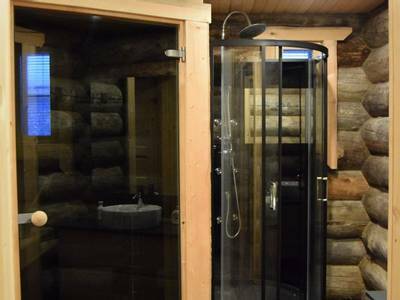 Read more The itinerary was carefully thought out as we spent plenty time on activities but also had plenty of time to rest, have a sauna and generally do what we wanted. The hotel staff are all very friendly and helpful and the guides were excellent. Would definitely recommend Muotka. Overall we had a wonderful holiday even though we didn't see the Northern Lights! We are planning to go back next year in February and will definitely use you again for the trip. It was a brilliant holiday. The food was wonderful - great variety and quality. The activities were great fun and our main guide was very knowledgeable and went the extra mile. We thought he was great! The pre-holiday information and its accessibility were excellent. The travel arrangements and transfers whilst tight were also excellent. The Muokta Wilderness Lodge staff were helpful and friendly, the activity guides were really good. The equipment that was at our disposal was of good quality. Read more even saw the dancing ones. I was there 7 nights and only saw them one night. Take a good camera and remove the filters (if you have them on it) and you'll have great pictures but the most important thing is to enjoy the moment. The hotel facilities are good and the staff were really nice. The food was really good, I only didn't like the reindeer, they are nice as animals but not as food. I totally recommend it. Snowmobiling and husky sledding were great. The Aurora display on the Thursday night was fantastic! Brilliant location; enjoyed all the activities. Read more Maja. Nina and her team and the activity leaders where all very helpful, knowledgeable, friendly and willing to address and resolve any issues. They made us feel at home. Read more If there is I don't know what it is. Additional comments: This was probably the last item on my bucket list. I couldn't be more delighted with the result. I loved all the activities, the guides were attentive and helpful as were the managers and staff at the lodge. It was by far one of the most amazing holidays we have ever had. Just wish I was still there! We saw the Northern Lights four nights on the trot. The activities were so much fun and the guides were excellent and we made lovely new friends. Will definitely go back...A holiday of a lifetime...perfect. Overall holiday rating: Excellent; I enjoyed all of the activities. Having never experienced any of them before, everything I did was good. The guides on every one of the activities made the experience extra special, lots of local knowledge. All staff at the lodge were excellent; they were very friendly and worked tirelessly to ensure we had an enjoyable holiday. Snowmobile safari to reindeer farm (was our favourite activity); a long and enjoyable day through a winter wonderland and chance to see reindeers. It was made perfect with a clear sunny day. Read more friendly, encouraging, supportive and patient, even when you couldn't help doing exactly what you had been warned not to! I felt that they were genuinely concerned both for our safety and that we should enjoy ourselves. The equipment provided, together with the suggestions sent before the trip were just what was needed to stay comfortable and warm (most of the time). Perhaps foot warmers should be encouraged for night time Aurora watching. The icing on the cake, well seeing the Northern Lights four times out of six nights was pretty amazing and I was completely entranced by the Aurora Camp, two hours of fabulous star gazing and Lights display with a 360 dgree view and a warm fire to thaw out by, what more could you ask for. Thank you, a very thoughtfully designed and managed trip. Activity guides were extremely knowledgeable and enthusiastic. (We) Very much enjoyed all activities equally. Read more and bent over backwards to make our stay enjoyable, nothing was too much effort for them as well as always being cheerful. A great credit to their nation. The activities involved snowmobiling, snowshoeing and a sleigh ride. The Aurora camp meant that the evening was going to be enjoyable with seeing Aurora activity the 'icing on the cake'. The holiday description gives enough detail of most of the activities to whet your appetite whilst just keeping back enough detail for most activities to still hold an element of surprise which was great and made the whole holiday a pleasure. It more than met expectations! Read more and guides were superb. Nothing was too much trouble for them and they organised our activity programme brilliantly. 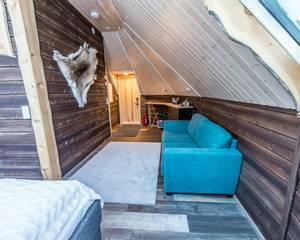 This is a fantastic place to stay as it is away from any settlement and all the equipment is on site so as soon as you are kitted up, you are off to enjoy the beautiful scenery. The guides were really knowledgeable about the area and the Aurora and obviously enjoyed their work.